The Context Map represents the first graphic visualisation of the story mapping process. The first layer shows the trends that structure the factors and shape the future scenario. The trends represent long-term issues that are projected to have relevance for at least 20 years, shaping the future European transport system in 2030. The second layer shows the stakeholders’ needs, political and economic factors impacting the future 2030 scenario. The items included in this layer represent some of the key elements of the trends listed as foundation of the map. The category ”uncertainty” is distributed over the other three categories, since the uncertainties can be referred to the above mentioned factors. The third layer, just below the narrative scenario of transport in 2030, lists the most relevant technologies that will enable the changes towards the future transport system. 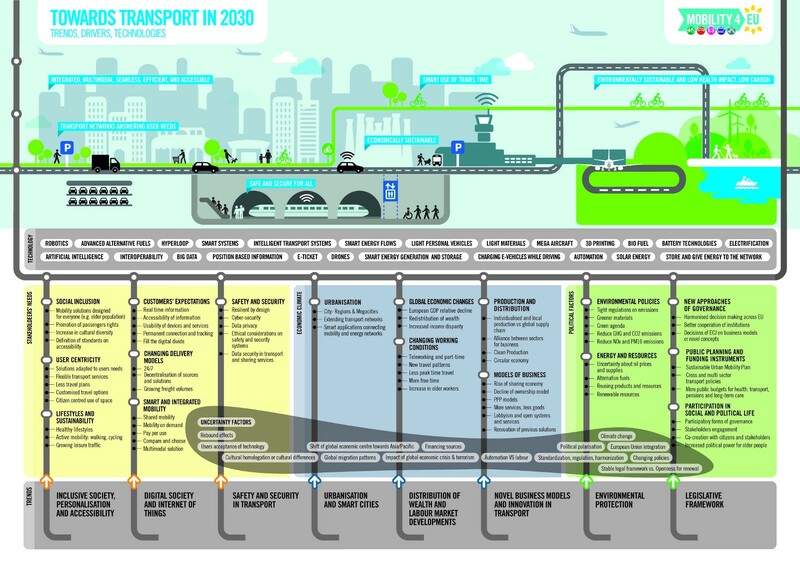 Finally, at the top of the map, the “future transport system scenario in 2030” is depicted and exemplified with some key features. The visual style of the map goes from abstract to figurative when moving from bottom to top, with the aim of clarifying the vision. The metaphor of the metro line was used to connect all the elements of the map to the future transport scenario in 2030.